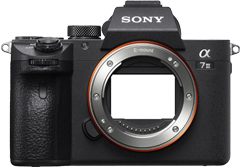 After the ground-breaking A9 and the eagerly anticipated A7R III, Sony has lifted the lid on the A7 III. At $2,000, the Sony A7 III is a much more accessibly-priced model, built around a 5-axis, image-stabilized, 24MP full-frame BSI CMOS sensor. Although not a “stacked CMOS” sensor design like that of the a9, some of the technology derived from that model has filtered down, such as an electronic shutter mode at a still impressive 10fps, and a new, faster hybrid AF system. Its 425 contrast-detection AF points are complemented by 693 phase-detection AF points with 93% frame coverage, which Sony say performs twice as fast as its predecessor. The new model also gets the vaunted Lock-on AF and Eye AF modes seen on the A9.